We are proud to announce Ch Jetta's Gunner-Seeker for the 2005 Season was 4th in standing. We are pleased to announce that she also followed in her GRCH Sire's foot steps and placed Top Ten Best In Breed at the Top Ten competition in Michigan in June 2006. Way to Go Seeker girl!! We are proud of you!! 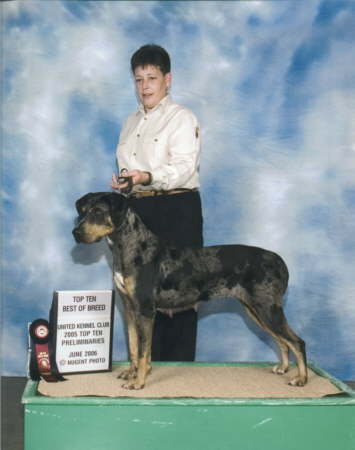 We are proud to announce Gunner's standing with the United Kennel Club after the 2004 Show season as #1 Catahoula. 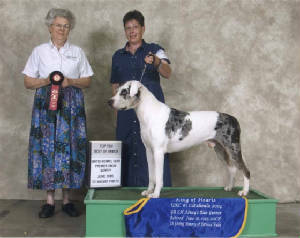 Gunner then went on to the Top Ten event on June 16th, 2005 in Michigan to compete against the other top ten ranked dogs and took the Top Ten Best of Breed. Later that afternoon Gunner took Best In Breed in the Louisiana Catahoula Leopard Dog Specialty held by the United Kennel Club. In the Top Ten he was in the ring with a niece off of his sister Blue DeSoto, a very nice dog Jetta's Indigo Blue. Was great to see the two in the ring together. In the Specialty he was in the Best in Breed ring with his youngest daughter Jetta's CooVara-G. Probably the last time they will be in the ring together. But was a great feeling to have the two in there together. Based on Gunner's titles and placements with the United Kennel Club we have made the decision to retire him in Style from UKC. It will give some of his offspring the needed time in the ring and hopefully accomplish what he has in his short show career with UKC. WAY TO GO BIG HEAD!! You Made Your Mom VERY proud of you!!!! !